Many thanks to Rosemary Burslem for drawing my attention to the following guide to Direct Payments, which has been published by Social Care Wales. It can be read in full by clicking here. This is a very illuminating guide, which clearly shows that Direct Payments can be used for other things as well as support from personal assistants. You can spend your money on social activities, evening classes and even holidays if they are in your care plan. Direct payments can also help if you want to do paid work or a training course. If you need special equipment or minor home adaptations an amount to cover these things might be included in your direct payments. It is clear that Direct Payments are intended to improve choice, control and independence for people. This is further evidence of the appalling practices of Wrexham County Borough Council (WCBC), who have done everything in their power to discourage DP recipients from spending their money on things that they are clearly entitled to. I believe that WCBC view that DP’s can only be used to pay for support is not in line with the ethos of the law on Direct Payments. When drawing up Care Plans with people who have chosen to have DPs Social Workers and clients should be allowed to be creative in how this funding is spent, as in the examples above. Those of us who do receive Direct Payments throughout Wales should read the article provided by Social Care Wales, and remember that we are in control of the money we receive and as long as it is spent responsibly and appropriately, then there is little that Local Authorities can object to. The following article was taken from the Leader Live website. I am claiming no credit for writing this article which also appears in the Leader newspaper. Improvements have been made to the way care is delivered for more than 1,000 disabled people in Wales to help ensure they get the support they need to live independent lives. Local Assembly Member, Lesley Griffiths, has welcomed the Welsh Government’s latest announcement and congratulated Wrexham resident, Nathan Lee Davies, who headed a strong campaign and made representations to the Deputy Minister for Health & Social Services, Julie Morgan AM, on the matter. 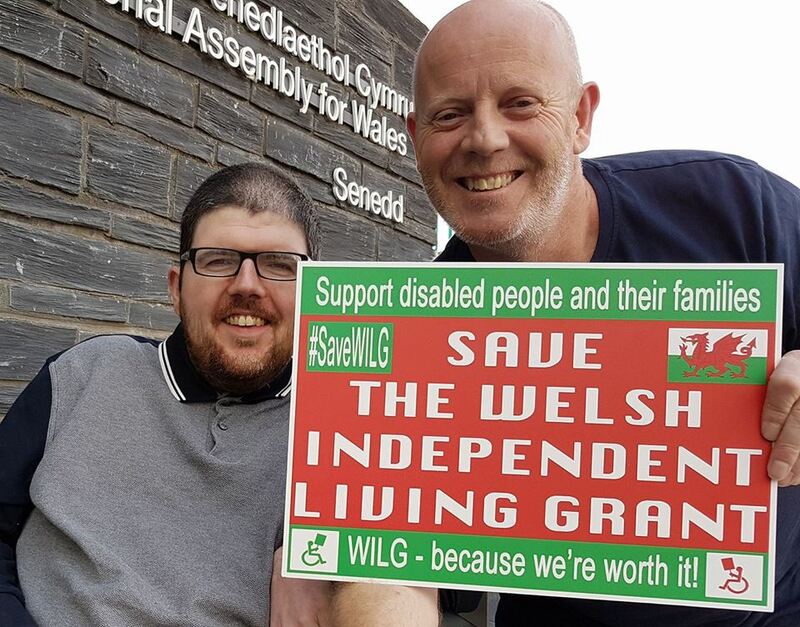 Concerns regarding the Welsh Independent Living Grant (WILG) were initially raised when it was announced the responsibility for the scheme, which had been introduced after the abolition of the Independent Living Fund (ILF), was to be passed onto local authorities to manage from April this year. Nathan feared the changes would have a detrimental effect on his wellbeing and initiated the ‘Save WILG’ campaign. The hard work has paid off as under the latest proposals, additional measures have been put in place to ensure nobody who was once in receipt of WILF, and its predecessor ILF, misses out as a result of the changes. An independent social work assessment will be offered to all former ILF recipients who are unhappy with their new care and support package and would like a second opinion. The Welsh Government will provide additional funding to local authorities for the cost of the workers to carry out these independent assessments and additional care hours that may result from the assessments. The £27m Welsh Independent Living Grant (WILG) was originally set up in 2015 following a decision by the UK coalition Government to close the Independent Living Fund. Welsh Government consulted with partners to develop a long term strategy. A two-year transition period began in April 2017 in which all former ILF recipients in Wales who were now in receipt of payments under WILG would have their care needs assessed by their local authority to ensure a care plan was agreed and support package put in place. While the transition period resulted in the majority of recipients being satisfied with the new arrangements, some former ILF recipients, who had not been subject to a care assessment since 2015, were concerned by the change in approach, with the reassessment causing tension in some cases. The announcement by the Welsh Government aims to address the inconsistencies, with evidence suggesting the variation between local authorities warrants a change in direction and the Welsh Government has written to local government leaders to request a pause of the transition with immediate effect in order to bring in revised arrangements. The following article was taken from the excellent blog by Luke Clements – a Professor of Law at Leeds University and a Solicitor. We really appreciate all the support from Luke Clements and the formidable Ann James in our bid to #SaveWILG. Let’s hope the Welsh Government actually listen to the mounting critics of their decision to close WILG. A case of Wales following in the footsteps of England? While attention is focused on the countdown to leaving the European Union, one should not lose sight of the impending closure of the Welsh Independent Living Grant (WILG) which has been earmarked for the 31 March 2019. The impact of the closure is already being felt by people who have transitioned from the WILG to Local Authority funded care and support. A strenuous and valiant campaign to # SaveWILG has been led by Nathan Davies. The sustained #SaveWILG campaign has gathered momentum in the final weeks before the proposed closure and has been given greater impetus by a letter from the Deputy Minister for Health and Social Services. In this letter Julie Morgan, sets out the outcome of the Deep Dive Review that was put into place by the previous Minister to evaluate the process and outcomes of the re-assessment of WILG recipients who have been re-assessed for Local Authority Services. The letter notes that 157 disabled people (of the 1,174 people who have been re-assessed – i.e. 13%) have suffered a reduction in their care and support provision. The Minister has since met with representatives of the #SaveWILG Campaign Group who have presented her with a dossier of evidence to reconsider her decision. The BBC Wales Live news item https://www.bbc.co.uk/iplayer/episode/b0c0x936/bbc-wales-live-23012019(at 8 minutes 40 seconds) has highlighted the impact on disabled people who have been reassessed and the impact on carers. The long term costs of leaving disabled people with high level care needs with insufficient support was highlighted by Tanni Grey Thompson who supports the continuation of central government funding. “… if an independent evaluation shows the new system is not working as well as the old one then I would be prepared to reverse it because this is money intended for a very specific number of people for a very specific purpose”. One must reluctantly come to the conclusion that the Welsh Government is following in the footsteps of England, albeit three years later. The closure decision has given scant consideration to the evidence from England on the effect of closure on disabled people and their carers and Wales has been prepared to continue along a trajectory that risks destabilising the established care and support of WILG recipients. A critical analysis of the intended closure of the WILG can be found by clicking here. The Deep Dive Review, referred to by the current Minister for Health and Social Services, was intended to be an independent audit of the process, impact and outcomes of assessing WILG recipients for transition to local authority services. Embedded in the review was the possibility of reversing the decision. If not it was merely a cosmetic exercise. The detail of the Deep Dive Review has not been made public as yet. There is neither information as to whether local authorities provided each previous recipient of WILG with independent advocacy nor if they offered a carers assessment to relevant carers. It is an indictment of a review which was supposed to give reassurance to disabled people about the veracity of the evaluation of the process of transition to local authority services, that disabled people were not consulted about their experience of the process and their satisfaction with the outcomes. Local Authorities representatives were however consulted and provided reassurance to the Minister that no major implementation issues had come to light. The letter from the Minister to the #SaveWILG campaign notes that some of the previous recipients of WILG are no longer eligible for social care and have been moved to NHS Continuing Health Care. Unlike in England, recipients of NHS Continuing Health Care are prevented by statute from having a Direct Payment to arrange care and support. This is a significant impediment to independent living and yet this has not been attended to in legislation (although in England this barrier has been removed). It now rests with the Minister of Health and Social Services to reverse the decision to close the Welsh Independent Living Grant and to offer a clear view on how Wales will meet the needs of disabled people with complex needs. The case note R (CWR) v Flintshire County Council(2018) is a salutary reminder of the experience of a disabled person in need of care and support in Wales under the Social Services and Wellbeing (Wales) Act 2014 and illustrates the understandable fears of disabled people when being assessed for care and support. The case is also a clear reminder that it is possible to effectively challenge unfair, unlawful or irrational decisions by local authorities. When I told my Social Worker that I was in need of 24/7 care in my own home, she actually laughed at the prospect of anyone in my local authority receiving such a level of care and support. Read the following paragraphs and you might discover why I NEED round the clock assistance to function as part of my community. 00.00: I am watching Porridge on Yesterday yet again, as I am too scared to go to sleep as I know I will probably wake up again in an uncomfortable position. This has happened far too frequently over the last 6 months and I have had to call my dad to straighten my legs, re position me in bed and rescue the duvet which often falls to the floor as I wriggle and fight to get comfortable. Hopefully, if Fletcher and company can keep me awake a little longer, I will be out for the count until the crack of dawn. 04.36: I wake up again. My legs are in agony. I check the time on my mobile and hope it is 06.00 or 07.00 so that I don’t have to wait too long for my staff to come in at 09.00. I look at mobile and am shocked to see that it is only 04.40. There is nothing I can do, but call my dad. This is far from ideal as he has arthritis in both hands and is in agony whenever he is having to assist me but those at WCBC do not care about my dignity or the dignity of my carers. It is freezing outside and my dad finds his way to my house – a five minute drive away – in perilous conditions. It takes him about 20 minutes to reach my house where he proceeds to straighten my legs, re position me in the bed and give me some paracetamol, which I swallow with water. I hope this medication will send me to sleep and I hope I wont be woken until my PA arrives in the morning. 07.00: Not again. I’m awake this time because my bladder is full. I reach for the light switch but my dad has moved it and forgotten to replace it – something that can be forgiven at 5 in the morning. It is still pitch black, but I really need to use my urinal. The trouble is I can’t see at all. I manage to sit up and grab hold of the urinal, but it is a real struggle to get it in the right position. I am too far gone to be able to calm myself down and resist the inevitable… another two hours until assistance arrives means lying helpless in damp and demoralising conditions. On the plus side, the Welsh Government are soon to be washing their hands of their responsibilities and local authorities across Wales can screw disabled people for all they can by providing them with inadequate care and support whilst squirrelling away funds meant for the most vulnerable in society. I am OK now after my PA came to the rescue, but one thing is for sure – this sort of situation can’t go on for much longer. WCBC MUST face up to the evidence that I have gathered from my GP, Neurologist, Urologist, District Nurses, Physiotherapist and Occupational Therapist that I need constant support in my own home for my physical and mental well-being. This shouldn’t be such a battle and that is why we need to retain and improve the Welsh Independent Living Grant as not all people who receive WILG can stand up for their rights in the way that I can. Present: Carol Gardener, Jo Woodward, Tom Hall, Mark Davies, Eric Owen, Sorrel Taylor, Maureen Lee, Sharon O’Connor, Chris Roberts, Jayne Goodrick, Paul Johnson, Lynne Jones, Lynne Davies, Nathan Davies, Sandra Morgan, Bill Fawcett, Vince West, Laura Seddon, Lisa Pollard, Simon Green, Michelle Brown AM, Eluned Plack, Eluned’s carer, Jacqui Hurst, Kathryn Shaw, Brian Harrison, Rhian Davies, Martyn Jones, Zoe Richards, Mark Isherwood AM, Gareth Davies, Rebecca Phillips. Apologies: Llyr Grufydd AM, Jan Thomas, Helen Mary Jones AM, Rob Williams, Kathryn Jellings, Andrea Wayman, Stephen Ben Morris, Louise (WCD), Owen Williams, Glenn Page. Mark Isherwood AM welcomed everyone to the meeting. 2. Minutes of the last meeting. The minutes were approved as an accurate record. Rhian provided an overview of the Welsh Government’s Draft Framework for Action on Disability. The document was created following a review of the Framework for Action on Independent Living, produced in 2013 to provide a strategic approach to independent living across Wales and to promote the social model of disability. 1. Improved access to information, advice, independent advocacy and peer support services. 2. Availability of accessible and supported housing to meet individual requirements. 3. A comprehensive range of options and genuine choice and control in how social care and support is delivered. 4. Improved access to person-centered technology. 5. Barrier-free transport system that includes all forms of transport. 6. Enabling access, involvement and social economic and cultural inclusion of all disabled people. There was a ministerial agreement to review the Framework for Action on Independent Living, three years on. This resulted in the Independent Living Steering group, comprising representatives from disability organisations across Wales, chaired by Rhian, to re-convene. The group reflected on what had been achieved since 2013. They recognised that whilst the introduction of the Framework was ground-breaking, progress on the ground was very slow and that national policy set by Welsh Government had not translated into local action. There was limited evidence in the change in culture, particularly by local authorities and local health boards in terms of taking on board a more rights-based approach to disabled people and to tackling barriers to independent living. This was endorsed in 2017 during a Welsh Government consultation. The general feedback was that very little had changed in the lives of many disabled people and has even got worse which was also a key finding from the UN Convention on the Rights of Disabled People. The UN Committee in Geneva was very critical of the UK Government in that they had regressed in their local policies. The steering group’s aspirations for the revised version is that it should be much stronger in terms of the UN Convention of the Rights of Disabled People. The Convention should be at the heart of the new Framework with a stronger commitment to implementation of the social model of disability and more robust action in terms of how that is understood by people. The steering group was of the opinion that there should be two documents. The main document, to set out the key commitments and principles for Welsh Government to abide by, plus a separate action plan that could be regularly updated and monitored with more specific detail about what different the Welsh Government departments would do in terms of delivery. The action plan, which is currently out for consultation, links more closely to the articles of the UN Convention. In order to produce a response to the consultation, Disability Wales ran two events along with an online survey to gather the views of disabled people. The deadline for responses is Friday 18th January but there could be an extension. Rhian added that Alison Tarrant from Cardiff University has produced an interesting paper looking at independent living policy. The paper was circulated to members prior to the meeting. The paper critiques the Framework for Action on Disability and a number of issues were identified. Disability Wales and other members of the steering group have been calling for incorporation into the UN Convention for the Rights of Disabled People (UCRDP), giving it similar status to that of the UN Convention on the Rights of the Child. Helen Mary-Jones AM is looking at how human rights can be incorporated in Wales. Rhian noted that there is a disconnect between Welsh Government’s principles and aspirations in relation to improving independent living for disabled people and the actual reality of accessing services and achieving their rights. Rhian highlighted the importance of the CPGD submitting a robust response to the consultation with the aim of strengthening the new Framework to ensure it takes forward the rights of disabled people in Wales. MI highlighted some of the findings from the study based on the Draft Framework for Action on Disability produced by Alison Tarrant of Cardiff University. These included the absence of ‘Advocacy’, which was previously identified in the 2013 Framework as one of the highest priorities. In addition, the 2013 Framework was constructed around a series of priorities identified by disabled people. The foregrounding of the priorities and expertise of disabled people has been removed. MI suggested these be considered when submitting a response. Nathan shared a video with the group, titled ‘Save WILG Campaign’. The video highlighted the issues faced by more than 1300 recipients of the grant. On March 31st, Welsh Government plan to close the Welsh Independent Living Grant (WILG) and transfer the funds to the Local Authorities. The funds will not be ring-fenced. The video, features an insight into Nathan’s condition, Friedreich Ataxia, a progressive disease of the nervous system. Nathan states that in order to be a productive member of society, he requires the help and support from personal assistants, funded by WILG. Without the grant, his care will be reduced from 86.5 hours per week to 31 hours per week. Back in April 2018, at the Welsh Labour Conference, a motion was passed to save WILG. However, this has not been acted upon yet. The Campaign has gathered political support from across the spectrum and still Welsh Ministers and some civil servants refuse to listen to the evidence collected. Nathan is particularly concerned that the money being given to Local Authorities has not been ring-fenced. Nathan’s strength and campaigning has been recognised by the Wrexham Glyndwr University who have made him an honorary fellow. To highlight the issues surrounding WILG, Nathan is running a series of campaigns across social media to influence a positive decision. Mark Isherwood AM invited questions and comments. In relation to WILG, Rhian informed the group that Nathan and the BBC made a Freedom of Information request. It emerged that only two-thirds of people have been assessed and although some had their packages maintained and some increased, a significant number had their hours cut. There were circa 17 instances of clients taking legal action against their local authority. In response to the Freedom of Information outcome, Huw Irranca-Davies AM agreed to examine this further to establish whether the issues solely related to Wrexham or whether the problem was more widespread. Rhian suggested the CPGD write to the new Minister, Julie Morgan AM for an update. The importance of disabled people needed better access to lawyers was raised. Mark Isherwood AM stated that the Equality and Human Rights Commission will occasionally fight a trial case to establish a precedent. The CPGD could submit a request if there was a particular matter that needed to be tested in court. He added that Welsh Government do not have control over Legal Aid but it is still worth highlighting any concerns and to ask what support they can offer to better access legal advice. Various sources of legal services were identified and will be circulated following the meeting. Disability Wales also have a guide on their website offering advice and information called ‘Know Your Rights, Use Your Rights, Live Your Rights’. Concerns were raised around the lack of proper planning and services available for the increasing number of children with disabilities which will result in their needs not being met. A member asked why Welsh Government has decided not to follow Scotland or Northern Ireland in terms of how they manage the Welsh Independent Living Grant if there is evidence to prove the system is working well in those areas. Mark Isherwood AM suggested Disability Wales seek data from Disability Scotland to identifying the positive impact the grant has had on recipients of the grant. The Chair welcomed further comments from the floor. Learning Disability Wales gave an update their work. In December Learning Disability Wales held its first ministerial advisory group meeting, chaired by Gwenda Thomas AM. The main focus was the Children’s Commissioner’s ‘Dont Hold Back’ report, investigating children and young people’s experience of transition across various policy areas. Martyn also informed members that Welsh Local Government Association (WLGA) has been consulting on a document around commissioning services and are looking to hold a national conference around it. Public Health Wales are working with LDW on a conference on reducing restrictive practice with the Education Minister. The Equality and Human Rights Committee are about to start a piece of work around access to courts to support disabled people to fully engage in the system. Rhian added that Disability Wales are working with Women’s Aid to establish the accessibility of refuges. A survey has been produced and will be circulated. The results will be compiled soon and asked whether it would be an opportunity hold a joint meeting with the Party Group on Violence against Women and Children to share the findings. Mark Isherwood AM welcomed a joint meeting with the Cross Party Group on Domestic Violence. Zoe Richards will circulate the date of the next meeting, to be held in Cardiff. 1. CPGD to produce a response to the Framework for Action on Disability consultation document and seek an extension to the deadline of the 31st January. 2. Zoe to share the link to Nathan Davies’ campaign video to members. 3. CPGD to write to Julie Morgan to summarise concerns and seek an update in relation to the issues identified following the Freedom of Information request. 4. Disability Wales to seek data from Disability Scotland to support the evidence around the positive impact of WILG on Scottish recipients. 5. Circulate an email requesting responses to the consultation.